David, in describing the LORD as his shepherd, pictures himself as a sheep. The picture below was made near Heshbon on the Transjordan plateau. 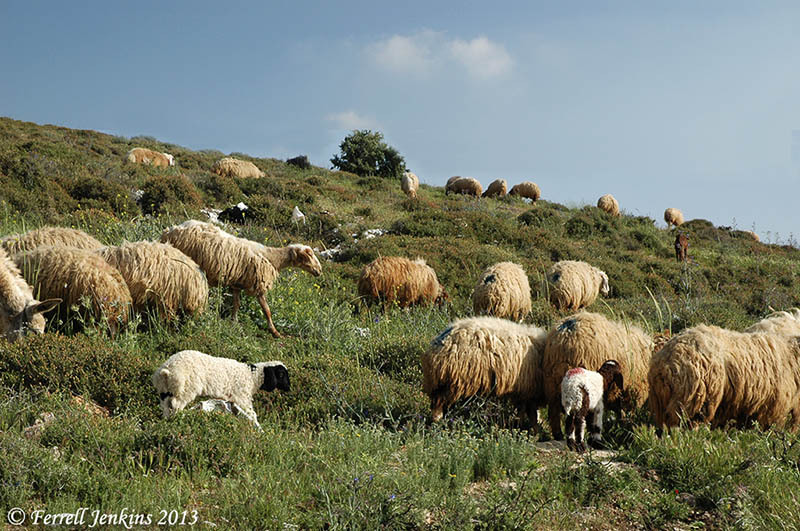 It is rare in Israel or Jordan to see sheep in such an abundance of grass. 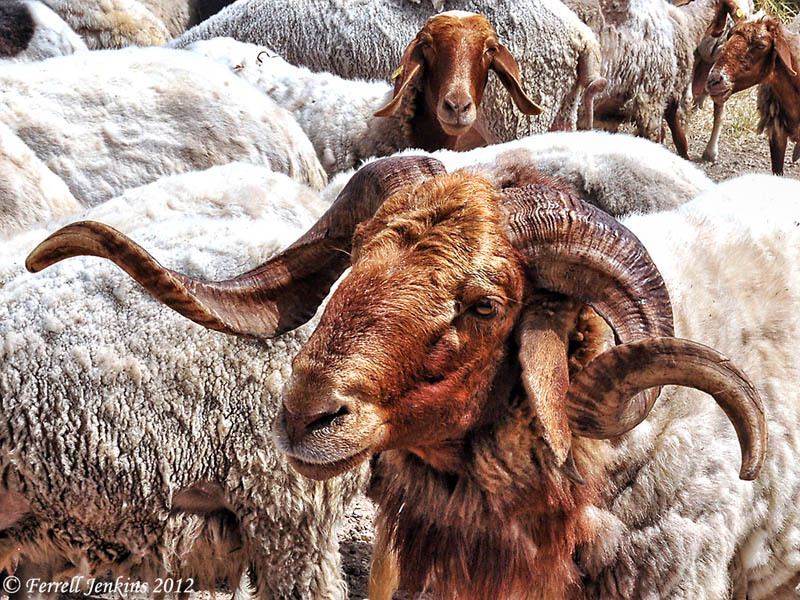 Sheep near Heshbon in Trans-Jordan. Photo by Ferrell Jenkins. The Hebrew term mishor describes “level country, table-land, plain … specifically of the elevated plateau or table-land between the Arnon and Heshbon” (Brown, Driver, Briggs). Take a look at Joshua 13:17 in several English translations. Most of the popular English versions use the term plain. The NIV and the CSB use the term plateau. We describe the area east of the Jordan Valley, now in the Hashemite Kingdom of Jordan, as Transjordan (the area across the Jordan). There are many hills, even mountains, in Transjordan, but the entire area is a plateau. In Israel there is a central mountain range between coastal plains and the Jordan Valley. In Daniel’s vision of a ram and a male goat we are given a glimpse of the two world empires following Babylon — the Medo-Persian Empire and the Alexandrian (or Hellenistic/Grecian) Empire. A ram. With horns like that it is easy to see who is boss. Photo by Ferrell Jenkins. In apocalyptic literature the visions take liberty with reality. It would require an artist to draw the ram and the male goat exactly as Daniel saw them. Then Daniel sees a male goat. 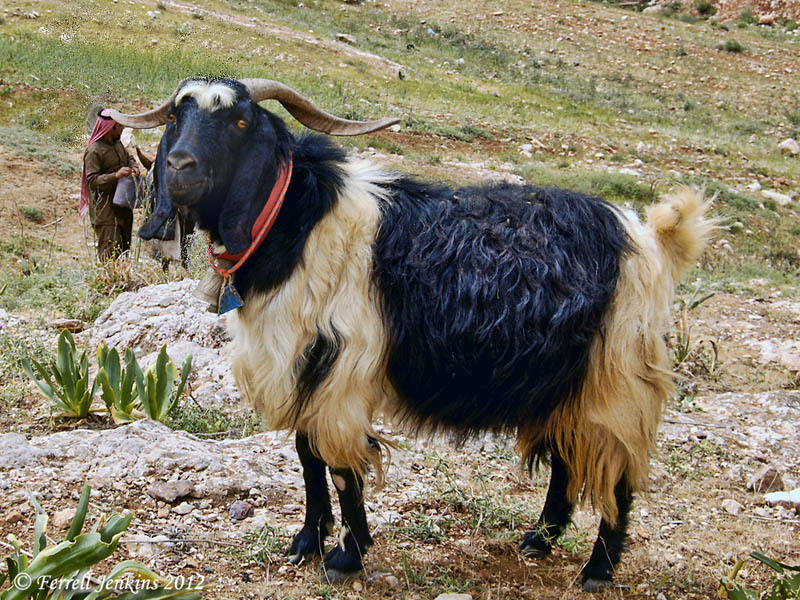 A male goat in Gilead (modern Jordan). Photo by Ferrell Jenkins. The interpretation is easier for us than it was for Daniel before Gabriel gave him an understanding of the vision (vs. 15-16). The ram’s horn was important in the history of Israel. One of the words often for the horn is shophar. A long blast on the ram’s horn was used to alert the Israelites when they could approach Mount Sinai (Exodus 19:13). The ram’s horn was sounded at the beginning of important feast days (Leviticus 25:9). After Israel marched around Jericho they would hear a long blast on the ram’s horn (Joshua 6:5). The word horn in this verse is qeren, but the word shophar is translated trumpet. I have observed that shepherds are proud of the ram of the flock. This photo was made last week in northern Jordan not very far from Ramoth in Gilead and the border with Syria.